Young Tudor's favourite pastime is the game of football. When he isn't playing footie he is either plotting to play footie, or he is dreaming about playing footie or he is dreaming about plotting to play footie. Footie is the greatest of his many obsessions. Over the last two years his expertise and the rules of his game have increased in complexity - so much so that his behaviour can serve as a case study in how a collie can adapt to new tasks and - given time - will invent incredibly complex rules which he will follow to the letter. Tudor had a fairly inauspicious start because when he saw his first football he tucked his tail in and ran a mile - he is easily terrified. However, after a few weeks stalking the then dog-sized object he learned to roll it about with his nose and to run after it when it moved. Soon his enthusiasm grew and when he forgot all about sheep and concentrated his considerable attention on this new black and white round object, he turned into a professional, learned to chase the ball at high speed, stop it with a minimum amount of effort and then dribble it home using his front paws and chest faster than many a young football player of the human variety. 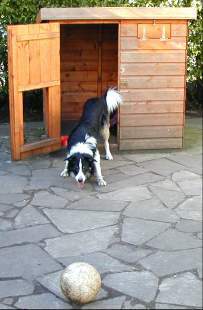 Most of our matches take place in the garden, where Tudor has a rather large doghouse which cost a fortune and is consequently ignored most of the time. The game always ends with me kicking the ball into his house and locking the door - the only way to stop him from enthusiastically trundling the slobbery leather into and through our clean little house- over the beds if at all possible. Tudor quickly realised that this signalled the end of the game and soon, whenever I tried to open his house to lock the ball away, he would try and stop me and hence prolong the match. This change of rules is now permanent and the game now consists of Tudor racing round the garden after the ersatz sheep and when I judge that his tongue is hanging out the required number of inches, I open the door to his house. This is the sign for him to stop chasing and he runs to the door and covers the yawning gap with his body - looking for all the world like the goalie that guards the posts for Northern Ireland. It is now my ungrateful task to try and score a goal, but over the months Tudor has become such an expert goalie that it is impossible for me to score. But when I do succeed, he will instantly stop the game, take a running leap to lick my face and then go and take a drink. Just recently he has refined this routine. When I score the final goal, the ball sometimes bounces out of his house and hence the game continues until I can get the scoring right. This is obviously against the rules of international soccer, but Tudor doesn't care and he makes his disagreement with the internationally agreed rules of world football quite obvious. Every time I score a goal he will watch his house for a fraction of a second, willing the ball to bounce out again. The latest addition to the game is a sneaky one - on both sides. Because he is such a good goalie and life is so short, I have been forced to end the game by picking the ball up and throwing it into the house. This can be done with such precision and from such a high angle that Tudor hardly sees the ball pass his nose. 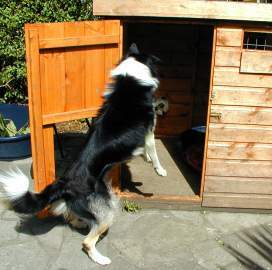 But collies are clever and Tudor is a young genius. Whenever he sees me bend down at the end of a game to lift the ball, he shoots forward like a torpedo and noses the ball from out of my grasp with amazing precision - and hence the game continues for another few precious seconds. I sometimes wonder what he will think of next. This last line was written some months ago and I now know the answer - which is obvious once to think about it. By now Tudor is such a good goal keeper that, when he thinks that I have had enough, he lets me score a goal deliberately and he goes to some length to congratulate me on the amazing accuracy of my right foot. If Northern Ireland had a better soccer team I would definitely let Tudor play for them!